Celebrity Gossip and Entertainment News: Leann Rimes Baby on the Way? Leann Rimes Baby on the Way? 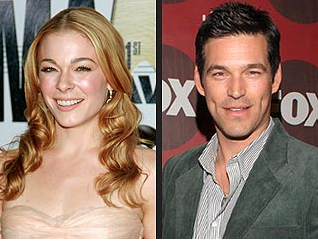 Leann Rimes sparks baby rumors on mother's day outing with her husband Eddie Cibrian. Is there a baby country cutie on the way? Leann Rimes and husband Eddie Cibrian stepped out for a Mother's Day brunch at Taverna Tony in Malibu the other day, and because of the recent pregnancy rumors, our photographers decide to ask the Grammy winner if there was a particular reason she was celebrating the holiday! Asked if there were "any new additions to the family coming up," the "Spitfire" singer casually said, "Yup!" and flashed us a shy smile. Did she just confirm she's expecting her first child with her actor hubby? Although she's still a skinny minnie, we did catch her at LAX airport the other day sporting what appeared to be the beginnings of a baby bump, so it's very possible she just gave X17online the official first word that she's pregnant! That toothpick isn't pregnant. The new addition is the side piece he is moving into the guest house. A baby ain't gonna keep this Gemini, he's been bored to tears already with horse faced skelator. Eddie is fine as hell though.